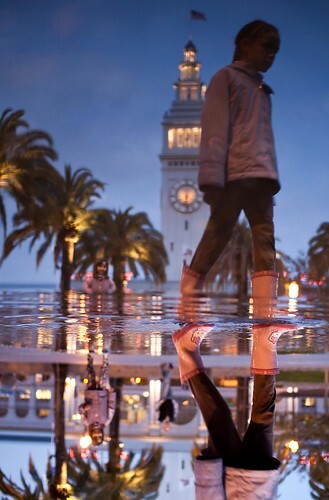 puddle jumping, a photo by jrodmanjr on Flickr. Today wasn't exactly the most relaxing of Saturdays. This was mainly due to the fact we had a lot of running around town to do getting bits and bobs for my daughter's birthday party tomorrow. (I can't believe she's turning five this week but I'll save that post for another day!) This wouldn't normally be stressful but my son refused to have a nap when he was obviously shattered. Pushing a grumpy boy round the supermarket was a little bit on the stressful side. Anyway, it's funny how a day can be rescued by one little moment. We had a quick walk to the local shop before bed so the kids could splash in puddles. We were trying out my little boys new boots and it was his first puddle jumping experience. He loved it! It was a lovely end to the day. I definitely think we'll go puddle jumping again soon. Looking at the weather forecast for next week I don't think we'll have to wait long for new puddles! No one is jumping in this puddle photo but I couldn't resist showing you it as it actually took me a while to realise that it's flipped upside down. I love the way puddle photos look so effective like this. And of course I love the light in this. I hope I can get better at capturing evening lights like this. I hope you are having a fabulous and stress free weekend.